Christmas is a time that I believe that all things are possible, and that happens in Clearview with Clayton and Abby. Meeting under dire circumstances, Clayton feels a pull toward Abby and her wayward brother, Brice. Making Brice work off his mistakes is just one way to keep Abby close until he can figure out what to do about her. What he doesn't expect is to genuinely like her and her brothers. Abby is at her wit's end. Trying to raise her two brothers after her mom left for greener pastures is harder than it sounds. When Brice is caught, again, doing something he's not supposed to, she just knows that he will end up in jail and all the hard work she's done in the past eight years will be down the drain. What she doesn't expect is to have a crush on Clayton East. His family is admired in their little town and she's just a nobody, trying to get her college degree and keep her brothers on the right side of the law. She notices Clayton watching her the same way she watches him and everything changes one afternoon. A sweet Christmas story where the good guy gets the girl and the bad guys get what they deserve. I really enjoyed this book, it was such a sweet story with a few twists and turns. Clayton and Abby meet under quite tense circumstances but they can't deny the pull they have to each other. Clayton wants his cattle back and he thinks the quickest way to do that is through Abby's brother, Brice, who was caught stealing some of the cattle. Once Abby starts to let her guard down, the sparks start flying. Abby and Clayton help to heal each other without even knowing it. I really hope there is more to this series as I did enjoy the book, but I want more. 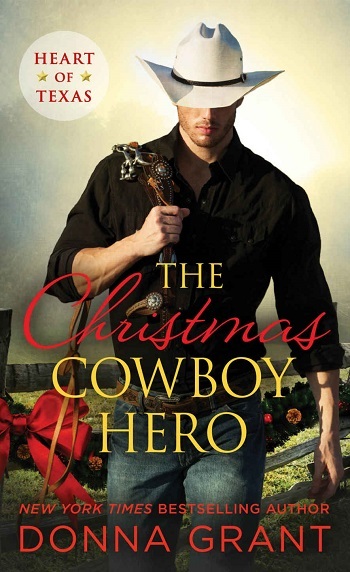 Reviewers on the Wicked Reads Review Team were provided a free copy of The Christmas Cowboy Hero (Heart of Texas #1) by Donna Grant to read and review.